On a recent trip to Sweden I encountered an elderly gentleman out walking his dog. We engaged in a brief conversation. Hearing my accent, he detected that I was an Anglophone and asked me if I’m English. “No,” I replied, “American.” He broke into a smile, laughed, and made a Nazi salute and said, “Trump!” We continued our conversation and he asked me, “Is Trump really as bad as the media here make him out to be?” He sought suggestions for newspapers and websites to find out “what’s really going on.” Although the dog-walker couldn’t have realized it, his combination of perplexity, curiosity, and mockery epitomises my experience as an American teaching the history of the United States during the Trump presidency. I arrived in Britain in August of 1992. I was nearing completion of my Ph.D. at Boston University and my supervisor had advised me, “It’s easier to get a job if you have a job.” So I accepted what I thought would be a one-year visiting lectureship in American history at a small teacher-training college in Southampton, England. Little did I know then that one year would turn into a career in the UK. I spent five years in Southampton before moving to the University of Edinburgh in Scotland in 1997. I had arrived in Britain just before the 1992 U.S. election when George H. W. Bush was still president. I’ve lived abroad and taught U.S. history during the two-term presidencies of Bill Clinton, George W. Bush, Barack Obama and now during the first year of Donald Trump’s administration. During the time that I’ve been teaching the U.K. popular attitudes toward the United States have ebbed and flowed. While these haven’t determined how we teach U.S. history – which isn’t all that different from what our colleagues in the U.S. and elsewhere do – they do provide an important context for our teaching and influence how students approach the subject (and which of the three categories I’ve outlined above they might fall into). 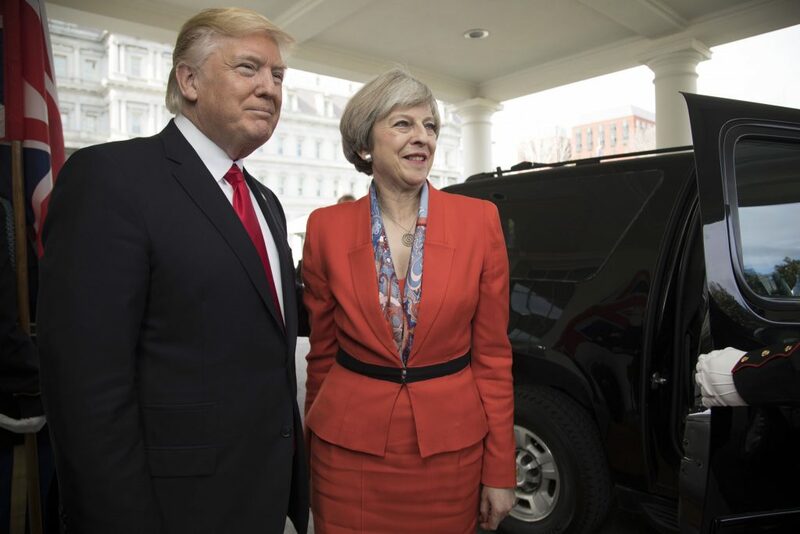 President Donald Trump greets British Prime Minister Theresa May upon her arrival, Friday, Jan. 27, 2017, to the West Wing entrance of the White House in Washington, D.C. (Official White House Photo by Shealah Craighead), public domain. I think the biggest difference between American history students in Britain and the United States is that the former bring a more acute awareness of the impact of U.S. foreign policy to their study of the subject than students within the United States. (I suspect this is true of most students outside of the United States, though my experience has largely been limited to Britain). During the time I’ve lived in the U.K. the lowest point in U.S.-U.K. relations was during the invasion of Iraq, the early stages of that war, and the aftermath of the 2004 presidential election. The Iraq invasion was very unpopular in Britain, especially Scotland, and many Britons felt that their nation was being dragged into an unpopular war against the will of the people. George W. Bush’s electoral victory in 2004, also unpopular here, seemed to confirm that the United States and the U.K. were on divergent paths. In a phrase that was common at the time, it seemed that Americans were from Mars and Britons from Venus. Our students during that time were particularly interested in the history of U.S. foreign policy and American engagement with the wider world. At such times teaching U.S. history is an especially rewarding pleasure – students who are engaged have a clear sense of the stakes, political and moral, of studying the past. Which brings us to President Trump. Trump is extremely unpopular in Britain. (He has repeatedly insulted Britain–sometime inadvertently, sometimes deliberately—most recently criticising the National Health Service.) There is a great deal of controversy over a possible state visit that he might make to the country. (It keeps being postponed, largely, it seems, because President Trump fears the inevitable protests which will ensue–predicted to be the largest since the Iraq invasion in 2003.) Despite President Trump’s unpopularity here there seems to be less anti-Americanism in Britain now then there was during the presidency of George W. Bush. I think there are several reasons for this: Trump has not (yet) dragged Britain into an unpopular war; Britain has recently experienced its own bout of populist politics during the Brexit referendum; Trump is sui generis, and people make a distinction between Trump and the United States. On a superficial level, Trump’s good for the business of teaching history. We’ve got more students than ever on our courses. He has repeatedly invoked American history, particularly Andrew Jackson and the Civil War to justify his policies and opinions. His take on U.S. history seems to be rooted in a particular mid-twentieth-century version that he was taught in school. This has proved to be an invitation for us to engage with more recent interpretations. 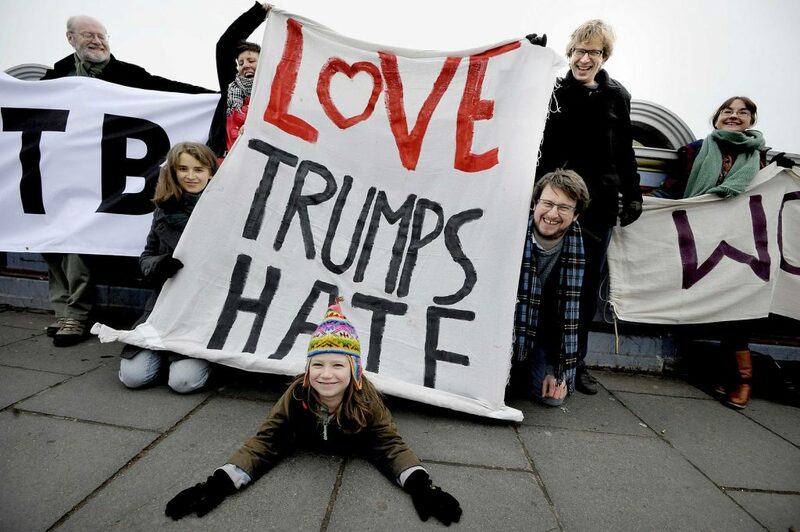 The British response to Trump mirrors that of my Swedish dog-walking friend—a collective chuckle and rueful shake of the head and curiosity to understand what’s going on. President Trump has demonstrated the importance of studying the American past. One of the unforeseen consequences of his election is that there’s probably not been a time in recent memory when it has been more to vital to be an historian. Frank Cogliano is Professor of American History at the University of Edinburgh. He specializes in the history of the American Revolution and early republic. He co-hosts the Whiskey Rebellion Podcast with his colleague, David Silkenat which seeks to provide historical context for contemporary events.